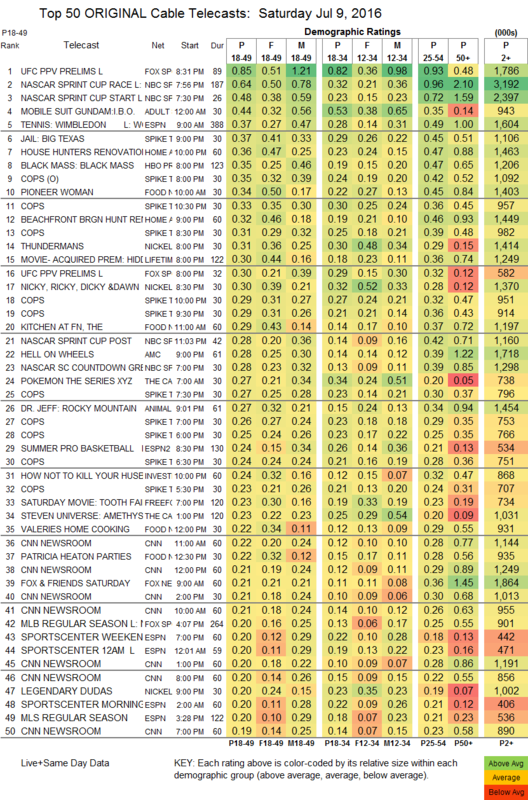 NETWORK FINALS: The 8PM ANGEL FROM HELL burn-off lost 0.1 in final numbers, while the NCIS: LA rerun went up the same. CABLE HIGHLIGHTS: The season finale of Starz’s OUTLANDER gained 0.04 from its last airing 2 weeks ago to 0.19. The rest of Saturday featured 3 sports events: Fox Sports 1’s UFC PPV PRELIMS topping cable at 0.85, NBC Sports Net’s NASCAR race at 0.64, and ESPN’s morning coverage of the WIMBLEDON women’s finale at 0.37. On Adult Swim (which ran a marathon of reruns last Saturday), DRAGON BALL Z ticked down from its last airing 2 weeks ago to 0.55/1.157M, MOBILE SUIT GUNDAM dropped 0.02 to 0.44, HUNTER X HUNTER ticked down to 0.43/931K, SAMURAI CHAMPLOO held at 0.37/840K, NARUTO was up 0.02 to 0.35/744K, ONE PIECE fell 0.02 to 0.29/647K, and PARASYTE lost 0.05 to 0.23/525K. On Spike, JAIL: BIG TEXAS debuted at 0.37, and what appears to be the only original episode of COPS was at 0.35. On HGTV, HOUSE HUNTERS RENOVATION was up 0.03 to 0.36 from 2 weeks ago, and BEACHFRONT BARGAIN HUNT was down 0.02 to 0.32 compared to last week. On Food Network, KITCHEN AT FN rose 0.03 from last week to 0.29, VALERIE’S HOME COOKING was up 0.02 to 0.22, and PATRICIA HEATON PARTIES was also at 0.22. On AMC, HELL ON WHEELS jumped 0.09 from last week to 0.28, and THE AMERICAN WEST gained 0.05 to 0.15.